Many Skype users may be reluctant to take a call due to how messy or inappropriate their surroundings may be. Now, however, the app's latest update adds a toggle that blurs everything but the caller out of a camera's shot. This new 'background blur' option is generated by AI, and should function on most PCs. Have you ever wanted to back out of a planned chat on Skype because the room you are in is messy or distracting in some way? Welll, the app's developers have a solution for you. The latest update to this popular Microsoft component now offers a new option to isolate the speaker on a call and blur out everything else around them. This may be a boon to users who may feel that their surroundings are not attractive or professional enough in some cases. It may also benefit the privacy-conscious, as well as those who just don't feel like cleaning up in a given moment. The new background-blurring effect has been ported from Microsoft Teams to Skype. It is facilitated by an AI, which, as the app's blog claims, is powerful enough to detect a caller and isolate all of their visual attributes from that of a background. 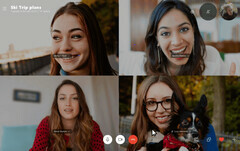 However, Skype did not mention if other people also in the shot who may not wish to be on camera will also be blurred out. In addition, the AI may not work in all cases, although Microsoft has asserted that it will make its best effort in each instance. The new Skype feature should be compatible with all laptops and desktops that run the app.